More than 22,000 words of edges, talents, tricks, traps, and tracking. 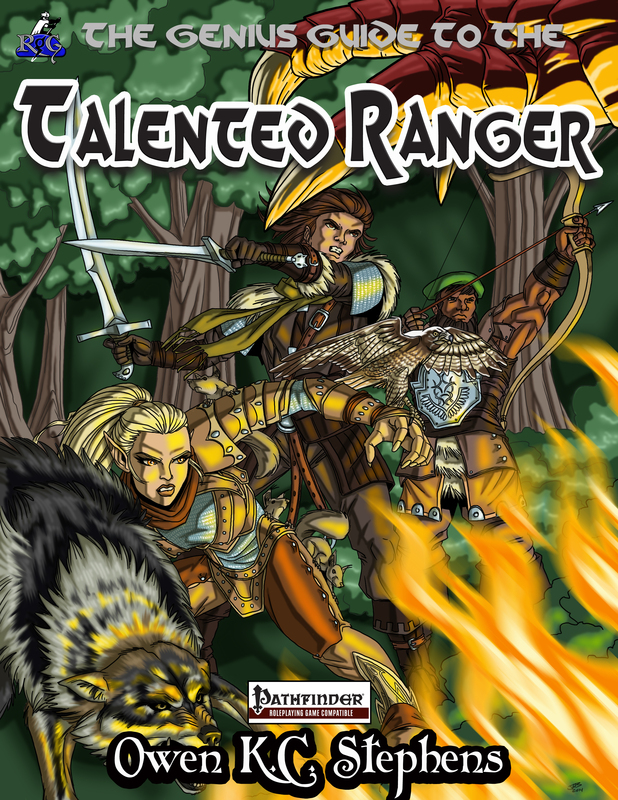 Find out what a ranger can REALLY do! I’m being flown out to Gen Con by Paizo, so I’ll be working the show for them this year. My first company-funded GC trip since 2000! Here’s my schedule for those who want to find me. I’m in the Sagamore Ballroom to assist with Pathfinder Society Events! I’ll be here until a little after 10am. I mysteriously disappear for the night! Awoooooooooo! Helping with pathfinder Society in the Sagamore Ballroom! Green Ronin has a seminar (which I likely won’t be around for) on Pathfinder and Green Ronin, at Crowne Plaza : Pennsylvania Stn A. Go see what Chris Pramas has up his sleeve! Meanwhile, I’ll be at the Sagamore Ballroom! I’ll be at the ENnies, starting with the Cocktail reception. I’m an “ENnie Dream Date” for Alyssa Faden, so come hang out with us! Once again, Pathfinder Society in the Sagamore Ballroom! Pathfinder Society in Sagamore all day, except for a break for lunch from noon to 1:30. Phew! I don’t fly out until 5pm, so if people still want to see me and are sticking around for a bit, I’ll be there! In late 2009 I wrote The Genius Guide to the Shadow Assassin for Super Genius Games. It was one of SGG’s earliest Pathfinder-compatible products, and we even took the unusual (for us) step of ordering custom interior art for it. It was a huge hit, and remains one of our most-reviewed and best-selling products. Given its great success I decided a follow-up product, The Genius Guide to the Shadow Warrior, was in order. While the shadow assassin was a stealthy killer inspired by tales of mystic ninja and darkness-manipulating sneaks, the shadow warrior was to be a more direct killer, a combatant steeped in the power of shadow, darkness, and stealth. Much as a ranger is a fighter with connections to nature, the shadow warrior was conceived as a fighter with connections to shadow. But the original design had some issues in playtesting. And then some other products came along that needed more attention. And then 3 and a half years passed. So last November I was bought out from Super Genius Games, but I got to take nearly all my Pathfinder-compatible design work with me. As I went through old files, I got excited about the shadow warrior again. I went back to work. i was going to have it out by the end of 2013! Then, I got offered a position as the Pathfinder developer for Green Ronin. I go back a long way with Green Ronin. They gave me a lot of my early freelancer breaks. Plus I am a huge fan of their setting and rule material, and getting to work on their coming back to d20 gaming was more than I could pass up. 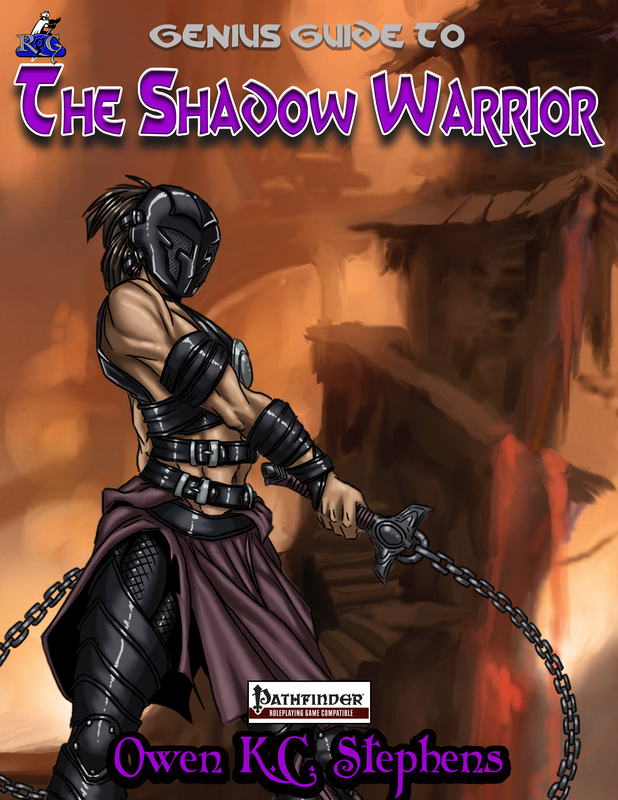 I accepted, got to work on the Pathfinder book for Freeport and the new Advanced Bestiary, and figured while the workload was going to delay things, I’d have the shadow warrior out by Spring of 2014! Then, I got a job offer from Paizo. I’m not complaining. I’m thrilled to be working for Paizo, even though it’s meant not pushing my own company, Rogue Genius Games, as consistently. Paizo has some of the greatest game and adventure designers in the world, and I am honored to have been included in their number. But it did mean packing up my entire household, moving halfway across a continent, and settling in to an office schedule again (after 14 years of setting my won work hours as a full-time freelancer). And I was (and am) still working for Green Ronin. So Spring of 2014 came and went, and Summer, hit, and I finally got settled enough to make that last push. So now, quick before Gen Con, I’m taking the last few steps to get the shadow warrior out into the world. Finally. More than 4 years after I originally planned it. So far, it looks like it’ll have been worth the wait.